Gradshop's High School Graduation Diploma Certificates represent the ultimate achievement in each stage of one's academic journey. Our top quality high school graduation diplomas come in two types, the stock high school diploma certificates and the custom high school graduation diploma certificates. With Gradshop, you can be assured that each graduation diploma certificate you purchase is made from the highest quality materials designed to last. It will also be a good idea to purchase any of our premium leather diploma covers to safely keep your graduation diploma for many years to come. 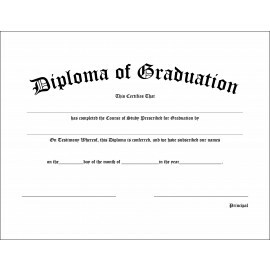 Visit Grad Shop for high school diplomas and other graduation accessories.